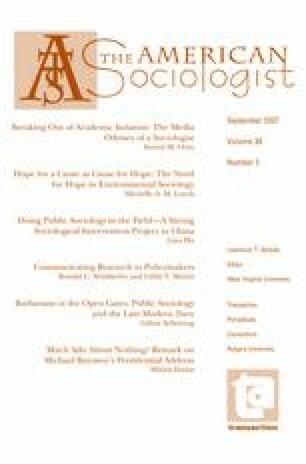 In this issue, we present a set of papers that continue the still fascinating conversation about “public sociology,” particularly in response to the conceptual model articulated by Michael Burawoy around the time of his presidency of the American Sociological Association (2003–2004), but also moving independently in new directions. The initial paper, by Steven Ortiz, provides a first-person account of the experience of communicating sociological research via mass media. Here, the sociologist moves from the well defined role of academic researcher to the unfamiliar position of public figure playing a very different game that involves high-profile risks. Ortiz offers reflections on how sociology departments, as well as graduate training programs, might better meet these challenges.